Stair climbing is an ideal workout — especially if you're a multitasker. You'll get your cardio in, which means lowering your risk of stroke and heart disease. And because you need even more muscle groups than you realize to climb a staircase or pursue those Stairmaster benefits, the muscles in your lower body all get an intense workout when you climb stairs, especially your legs and glutes. Talk to a physical therapist if you have concerns about your knees. Climbing stairs is a great lower-body toner, but you may need to make positioning adjustments to prevent joint pain. The staircase or Stairmaster benefits you'll reap when choosing climbing as your workout are especially good for your legs. By using all of the muscles at once, your legs will begin to "lengthen" because you'll have leaner tone along the entire length of your legs. The specific muscle groups impacted by climbing stairs are calves, quadriceps (front of thighs), hamstrings (back of thighs) and hip flexors. Using a staircase or Stairmaster for glutes is also an effective way to tone your rear. And you also have the option to do additional conditioning exercises on the stairs, enabling you to work your abs, arms, shoulders and back. Stair-climbing machines each have their own bells and whistles, including video screens and the ability to compete against online users around the world. Most important, the various stair-climbing machines have settings that allow you to vary the steepness of your steps as well as the resistance to your stepping and the speed at which you go. 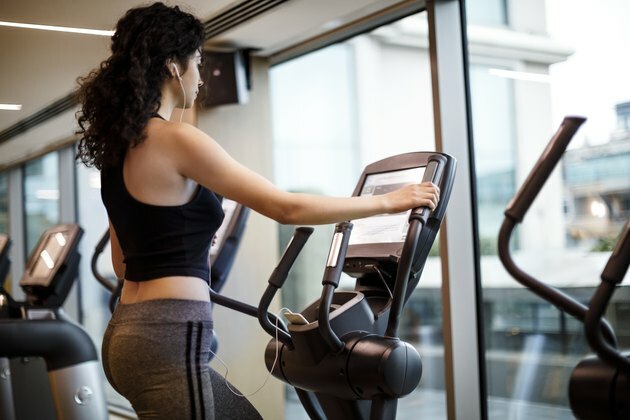 While using a Stairmaster for glutes and other lower-body benefits is an effective workout, there are a few guidelines to keep in mind for safety and maximum impact. Don't bear down too much on the handrails, because that will decrease the amount of work your legs need to do. In addition, the pedals of these machines require you to always put more weight on the heels than the balls and toes of your feet. Of course, you should make sure your shoes are always fastened securely so they don't get caught in the pedals. Varying the "terrain" kick-starts your muscle conditioning even more. If possible, switch between one and two stairs at a time for calves, thigh and glute engagement. In addition, when climbing steps one at a time, adjust the speed between fast and moderate climbing to engage your muscles' fat-burning mechanism. To really make the most of working out on stairs for your calves, thighs and glutes, add a few resistance exercises, either before or after your stair climbing. These moves engage upper-body muscles as well as lower-body muscle groups. Walk up the step sideways. The foot closest to the staircase goes on the step first, followed by the second foot. Stay slightly bent at the waist and knees and engage your abs. Wait until both feet are on the step before putting your closest foot on the next step. When you reach the top, walk down the staircase normally; then position yourself so that you are going upstairs sideways again, but this time with the opposite foot going first on each step. Go down the stairs in a sitting position. Crab-walk down the stairs with your arms on the step just above you. Make your glutes do the most of the work by keeping your hips raised off the stairs as you crawl down facing forward. Hop off the bottom step. This modified squat really works your core. Bend your knees, but keep your back straight and ab muscles engaged. Lightly hop off the step, keeping your knees bent and moving your arms forward, to soften the impact and maintain your balance. Step up on the bottom step again and repeat the process. Can Walking Up and Down Stairs Replace Walking for Exercise?